Andrew Watt proposes policy and institutional reforms to achieve balanced growth and convergence in the Euro Area. Watch a video interview conducted by Michael Landesmann. Current account imbalances were at the heart of the crisis that engulfed the monetary union in the global financial crisis. A stable monetary union requires a framework to limit imbalances and promote sustainable growth. In his presentation at wiiw, Andrew Watt from Hans-Böckler Foundation made a proposal for institutional reforms to achieve balanced growth and convergence in the Euro Area. 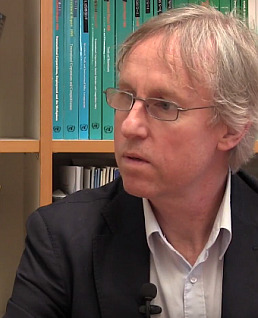 The video interview was conducted by former wiiw Scientific Director Michael Landesmann. Andrew Watt is Head of the Macroeconomic Policy Institute (IMK) at the Hans-Böckler Foundation in Düsseldorf. Previously he worked as a Senior researcher at the European Trade Union Institute (ETUI) in Brussels. His main research fields are economic governance of the euro area, economic and employment policy in Europe and comparative political economy.